Towards Impressionism marks the first time that an exhibition drawn exclusively from the Musée des Beaux-Arts in Reims, France—home to one of the largest collections of French 19th-century landscape painting —will travel to the United States. The Cornell Fine Arts Museum is the first of only two venues nationwide to host this extraordinary exhibition and the only stop on the East Coast. The exhibition traces the revolutionary evolution of landscape painting in France from Romanticism to Impressionism, telling the story of how Impressionism came to be and of its lasting power. Landscape painters active in the first half of the 19th century found their major inspiration in Dutch and English landscape art. Many were active roughly from 1830 until 1855 in the village of Barbizon, on the edge of the Fontainebleau forest. 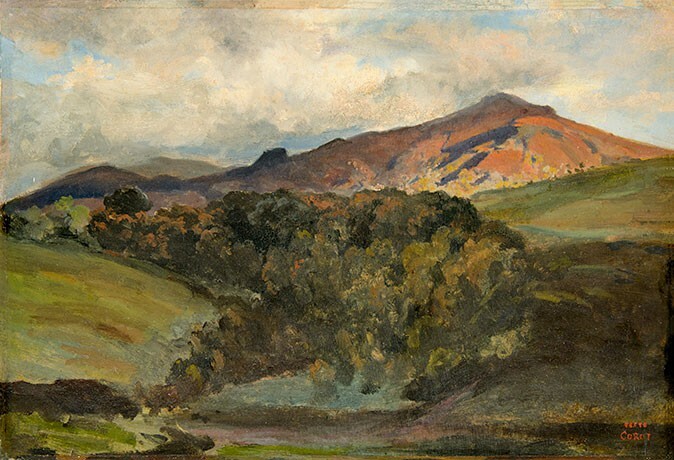 These artists like Théodore Rousseau, Jean-François Millet, Narcisse Virgile Díaz de la Peña, Charles Jacque, Constant Troyon, Jules Dupré, and others rejected urban life and burgeoning industrialization, seeking instead untouched nature in its original form. They were fascinated by the mysteries of the forest and the rural tradition later described by George Sand in her pastoral novels. 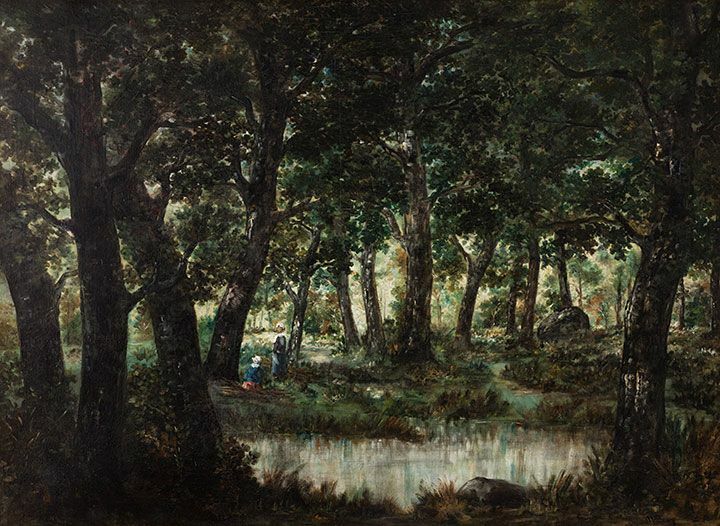 Théodore Rousseau (1812-1867) was a friend of the novelist and acted as the leader of the so-called Barbizon School. Rousseau rebelled against official art teaching, adopting thickly applied paint in contrast to the smooth surfaces seen in academic paintings. One of the most significant painters and a frequent visitor to the forest of Fontainebleau was Camille Corot (1796-1875). Reims is proud to possess the second largest collection of his work after the Louvre: 27 authenticated works, 17 of which will be displayed in this exhibition. The Medici Fountain (after 1845) will remind visitors of Corot’s first trip to Italy in 1825. On his arrival in Rome he was immediately dazzled by the southern light that was to become one of the principal subjects of his work. Corot never forgot these formative years, idealizing the landscapes he had studied in the open air as he re-created them later in his studio. Later works herald Impressionism, reminding the visitor that Corot was interested in the ever-changing flow of time and atmospheric effects, painting the same motif at different times of day. Honfleur, on the Normandy coast at the mouth of the Seine, also became a magnet for artists from about 1850 onward. Gathering at the Ferme Saint-Siméon to exchange ideas and support each other, these painters included Eugène Isabey, Paul Huet, Eugène Boudin, Constant Troyon, Jean-François Millet, Camille Corot, Gustave Courbet, Claude Monet, Frédéric Bazille, Johan Barthold Jongkind, Adolphe-Félix Cals, and Louis-Alexandre Dubourg. Eugène Boudin, (French, 1824-1898), Sur la plage de Trouville, undated, Oil on canvas, 24 x 27 3/4 in., Musée des Beaux-arts de Reims, Reims. Eugène Boudin (1824-1898) was one of the first artists to paint en plein air in Honfleur, encouraging Claude Monet, 16 years his junior, to follow suit. Boudin drew his inspiration from Normandy seascapes and coastal scenes; nobody could capture the endless horizon and the wide expanse of sky in quite the same way. His friend Camille Corot, who purchased several of Boudin's pastels, dubbed him the roi des ciels (King of Skies)—praise indeed from an artist who himself ascribed such importance to representing the sky and the atmosphere. Gustave Courbet also succumbed to the magic of the lightness and transparency of a Boudin sky. Eugène Boudin can thus be cast as the immediate forerunner of the Impressionists. Jean-Baptiste Camille Corot. Le coup de vent (The Gust of Wind), ca. 1865–70. Oil on canvas. © Musée des Beaux-Arts, Reims, Legacy Jules Warnier-David Photo: C. Devleeschauwer. The exhibition presented at the Cornell Fine Arts Museum will display 45 paintings in total by several School of Barbizon painters active after 1830 and by the artists’ circle founded by Eugène Boudin in Honfleur around 1850, as well as from the Musée des Beaux-Arts' collection of Impressionists, including works by Claude Monet, Pierre-Auguste Renoir, and Camille Pissarro. This beautifully illustrated volume follows the artistic forebears that led up to the works of Claude Monet, Camille Pissarro, and Pierre-Auguste Renoir, by way of pastel palettes, loose brushwork, ordinary figures, and natural landscapes.